Mystery Photo No. 19 and its answer was kindly supplied by Mr Kim Dunstan. It shows an A4G secured to the deck of an aircraft carrier, which is not HMAS MELBOURNE. Why were Skyhawks operating off her? What was the year and month the image was taken? No website users ventured an answer on this Mystery Photo. 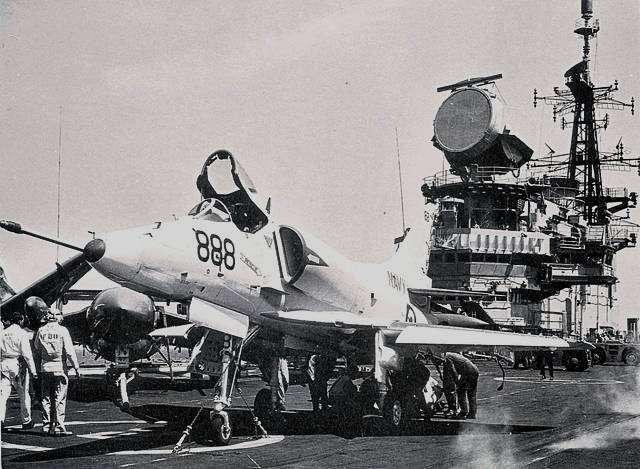 The image shows an RAN Skyhawk A4G on the flight deck of HMS Hermes during a ‘sales visit’ to Australia in October 1968 (note the type 984 ‘searchlight’ radar and Sea Vixen in the background). During the visit senior RAN and government officials inspected ‘Hermes’ and RAN Skyhawk and Grumman Trackers did trial landings. At the time the RAN was considering a replacement aircraft carrier for HMAS Melbourne and because HMS Hermes had been declared surplus to requirements in 1966 she was offered to Australia. But the sale did not go ahead as the manning requirements, extra aircraft facilities and additional running costs were beyond the RAN’s budget, and what the government was prepared to pay – so the offer was declined. Interestingly HMAS Melbourne remained in service until decommissioned in May 1982. Meanwhile, HMS Hermes was refitted and in April 1982 served as flag ship during the Falklands War; she was then acquired by the Indian Navy in 1987 (serving as INS Viraat) and only recently was taken out of service, in July 2016. 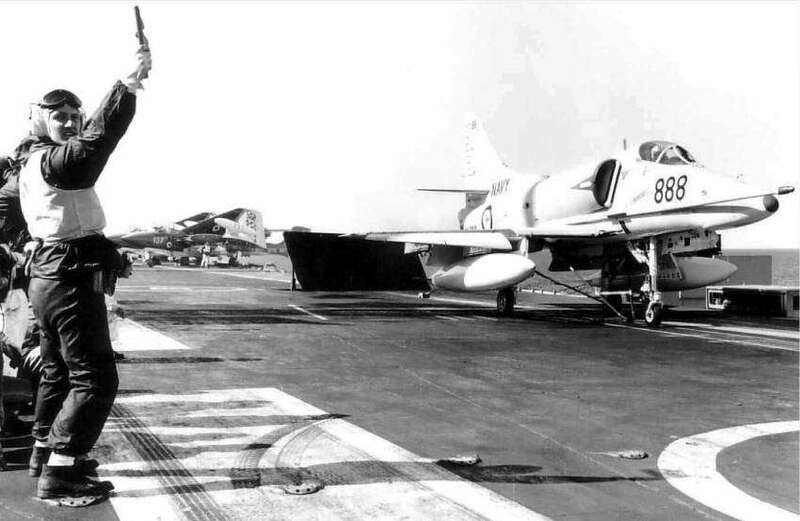 Also of note: at the time the image was taken Melbourne was in refit (Dec 67 to Feb 69 upgrading to Skyhawk and Tracker standard) so the photo shows the first A4 operations from an aircraft carrier. Some of those operations can be seen here.